Vitamin D Deficiency and Hair Loss | Is Your Thinning Hair Caused By Lack of Vitamin D? are vitamin D deficient. It’s not common knowledge so I wanted to write about it and let people know that there might be a simple way to improve your hair health – vitamin D supplements. Here’s what we know about vitamin D deficiency and hair loss. Most people don’t tend to associate vitamin D with hair. We associate it with strong bones because it aids in calcium absorption. But do we associate it with strong hair? Not really. At least I didn’t. If you are pulling hundreds of hairs out of your hair brush every day, you might be vitamin D deficient. Of course, there can be many different causes of hair loss so there’s no guarantee that vitamin D is the cause of yours but it’s definitely worth checking it out. Besides, everyone should have their vitamin D checked because it’s vital for so many other bodily functions besides hair growth. I recently found out that I was vitamin D deficient, with my blood test result measuring only 15 ng/mL. The normal range is 30-100. It was a couple of days after getting the results of this blood test that I remembered that I had been experiencing more hair loss than usual lately and I wondered if there was a connection. I don’t know how long I’ve been vitamin D deficient, unfortunately, so I can’t say if there is a correlation in my case between dropping vitamin D levels and thinning hair but I decided to do some research. It turns out that vitamin D deficiency and hair loss are indeed connected. 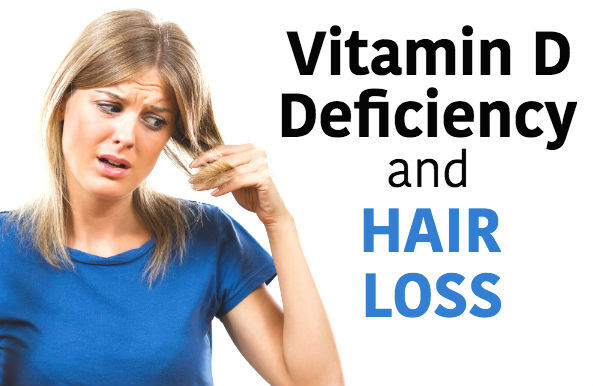 People with alopecia, an inflammatory condition that causes severe hair loss, are often deficient in vitamin D. One study found success in treating alopecia with topical vitamin D.
Women with thinning hair are also often found to be vitamin D deficient. One study found that women aged 18 to 45 with female pattern hair loss (FPHL) or chronic telogen effluvium (TE) were more likely to be deficient in vitamin D and iron. Telogen effluvium is a common form of hair loss that is caused by a usually temporary reduction in hair follicles that are producing hair. In essence, the hair follicles go dormant for a period of time so that there are more dormant follicles than active follicles. This results in thinning hair. According the American Hair Loss Association, this condition can be caused by things that are stressors on the body like childbirth, crash dieting, chronic illness, and physical trauma like surgery or car crashes. Some drugs like antidepressants can also cause this type of hair loss. Male pattern baldness may also be a result of vitamin D deficiency. WHY ARE SOME PEOPLE VITAMIN D DEFICIENT? For people living in northern climates without much sun, it can be difficult to get enough vitamin D. If you have darker skin you might never get all you need from the sun even if you live in a sunny southern climate because it’s harder for people with more melanin production to absorb vitamin D. The paler you are and the harder it is for you to tan, the easier it is to absorb vitamin D. I’m pale in the winter but I tan easily, so my doctor said that means it’s harder for me to absorb vitamin D than someone who burns and doesn’t tan. Other reasons for being deficient might be because a person isn’t eating enough foods containing vitamin D. Vegans may be especially at risk because almost all of the foods that are high in vitamin D are animal products. Tuna, salmon, mackerel, egg yolks, beef liver, and dairy products fortified with vitamin D are all good sources. Some cereals, juices, and soy milks are fortified, however, so there are some non-animal product food options that contain vitamin D.
According to The Journal of Oncology Practice, the signs of vitamin D deficiency include fatigue, depression, headache, hair loss, insomnia, back pain, joint pain, and muscle weakness. Over the long term, vitamin D deficiency can cause osteoporosis because vitamin D is necessary for calcium absorption. Now that I know more about vitamin D, I wish all young people would have their levels tested starting in their teens so that they can take steps to prevent osteoporosis at a young age. Getting your vitamin D levels checked is an easy thing that you can do to see where your blood levels are at. All you have to do is ask your doctor to order the test. If you don’t want to go to the doctor you can buy a vitamin D testing kit to test your levels on your own. There seems to be a lot of debate among scientists and health professionals about what the ideal level of vitamin D is and what constitutes deficiency. Currently, most agree that anything below 20 mg is a deficiency. A Danish study found that people whose levels were in the 50 – 60 range had the best overall health. It is possible to have vitamin D levels that are too high. A study found that levels in excess of 100 ng/mL were associated with an increased risk of atrial fibrillation. When vitamin D levels in your blood are too high, it can cause hypercalcemia, a condition that elevates calcium levels in the blood. Your liver will also start producing an excess of 25(OH)D, a chemical the liver produces as a result of processing vitamin D. In fact, the blood test to measure one’s vitamin D levels is a measure of 25(OH)D because it is the best way to tell how much vitamin D the body is getting. My doctor said that I needed to start taking supplements right away. At the moment I’m taking 5,000 IU per day in order to get my levels back up. My doctor says I should do this for 30 days and then drop down to 1000 to 2000 per day. In three months, I’ll have my levels retested. I can’t tell you how much vitamin D is right for you. After you get your vitamin D levels tested you should talk to your doctor about how much you should take. The Vitamin D Council says that vitamin D toxicity usually occurs when people take 40,000 IU per day over several months. It can also happen if one takes a large dose of vitamin D all at once. Everyone is different but if vitamin D is the cause of your thinning hair and you start supplementing, you should start seeing some changes after a few weeks and within a few months you might see thin areas filling in. There are anecdotal reports of people finding lots of short one inch hairs around their hairline and temples after a couple of months. In addition to vitamin D, you might want to consider supplementing with B complex vitamins like biotin and pantothenic acid, vitamin C, zinc, iron and fish oil for omega-3 fats. Foods that are rich in omega-3s are egg yolks, sardines, tuna, salmon, mackerel, and walnuts. Interestingly, several of these foods are also high in vitamin D and the fats in these foods help with vitamin D absorption because it is fat soluble. Getting a few minutes of sun exposure without sunscreen can also help your vitamin D levels. Don’t stay out long enough to burn but just go out in the sun for a few minutes each day with your arms, legs, and face exposed. A lot of people are vitamin D deficient and don’t realize it. I had no idea until I was tested. This can lead to a whole host of problems from hair loss to osteoporosis. Taking the step to check your levels can get you started down a path of taking charge of your own health and healing. Ready to start supplementing with vitamin D? Here are some of the best D supplements that you can order online.